Cordyline Crimson Star is a smaller clump-forming Cordyline that forms a rosette to 3 feet tall with glossy arching red leaves that first emerge narrow and widen with maturity. Plant shows it best color in full sun (along coast) to part shade in hotter locations and planted in a well-drained soil with regular to occasional irrigation. 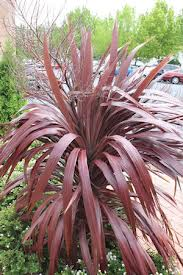 It has a similar hardiness as other Cordyline hybrids and will tolerate temperatures down to 20 F. it is a nice plant for containers or the front of a planting where the attractive red arching foliage can be emphasized. We sell this spectacular plant in one gallon containers.